The Malaysian Port of Tanjung Pelepas ordered 93 Kalmar terminal tractors by Finish engineering equipment firm Cargotec worth 5.2 million USD. The order is the largest one for for terminal tractors in Malaysia and the first deliveries already started in end-December 2016. The concerned Kalmar 4×2 medium terminal tractors were manufactured in Shanghai, China with the design and offering specially optimized for the Asian market. The cargo handling equipment have a gross combination weight of 70 tonnes and they will be used to handle containers. The investment aims to increase the capacity and speed up the cargo handling operations into the Malaysia port, meeting the increasing turnover and number of calls. “Our aim is to help PTP to improve the efficiency of their every move and lower their operating costs with our high-quality terminal tractors. Our factory in Shanghai is fully committed and working at full speed to deliver the ordered machines on time as promised. This is our largest terminal tractor order to date in Malaysia”, said the Sales support manager of Kalmar, Colin Cen. The Port of Tanjung Pelepas is the largest container terminal in Malaysiam located in Johor Bahru District, Johor. It is part of the APM Terminals Global Terminal Network, which holds a minority share in the joint venture. 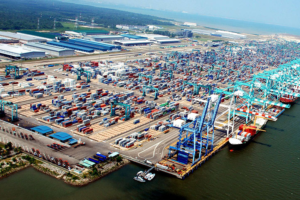 Port of Tanjung Pelepas handled total 9.2 million TEU in 2015, having average annual growth of 7%.